Psychopaths are everywhere. You might even be reading the words of one right now! But how can you tell? In the aftermath of the corporate chaos that marked the last decade, this question is becoming ever more important. If recent estimates are true -- that one in ten CEOs are psychopaths, the same probability that any one person may at any one time be carrying the common cold -- then if you've worked in a total of ten different places during the course of your career (and that's about average) you're bound to have run into one. But, like the common cold, are there tell-tale signs and symptoms of psychopathy -- the psychological equivalents of a sore throat and runny nose? Are there general giveaways that can help us keep our distance? The answer is yes... and no. Any starter pack for would-be psychopath-spotters should begin with a word of warning. Just as the common cold may be defined by any number of symptoms -- runny nose, sore throat, tickly cough, headache, lack of energy, temperature etc. 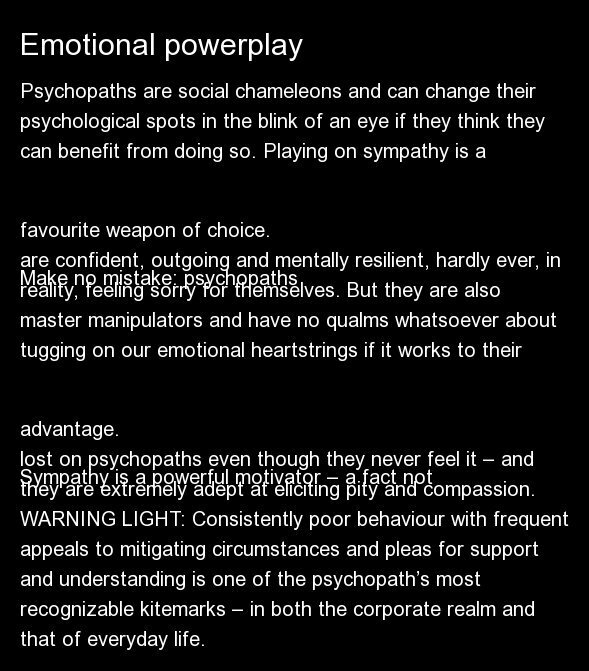 -- so psychopathy is characterized by a variety of different personality traits. But these traits -- ruthlessness, fearlessness, charm, persuasiveness, egocentricity, impulsivity, and the absence of conscience and empathy -- need not all be present to the same degree for a diagnosis to be made. Just as no one cold is ever identical to another and may vary according to the presence, severity, and duration of the symptoms, so there is no such thing as the definitive textbook psychopath. Profiles may fluctuate across the various composite traits -- indeed, there's evidence to suggest that it's relatively low levels of impulsivity, for instance, which separate out so-called functional from criminal psychopaths -- but as long as the aggregate level across all of the principal features exceeds a pre-specified norm (as determined by scores on specialized psychometric tests) then the psychopath light flickers on. That said, however, there are a number of tells for which any serious psychopath-spotter should keep their eyes open on the trail of their quarry in the workplace. Here are eleven tells that pretty much all of the species displays. Psychopaths are social chameleons and can change their psychological spots in the blink of an eye if they think they can benefit from doing so. Playing on sympathy is a favourite weapon of choice. Make no mistake: psychopaths are confident, outgoing and mentally resilient, hardly ever, in reality, feeling sorry for themselves. But they are also master manipulators and have no qualms whatsoever about tugging on our emotional heartstrings if it works to their advantage. Sympathy is a powerful motivator – a fact not lost on psychopaths even though they never feel it – and they are extremely adept at eliciting pity and compassion. <strong>WARNING LIGHT</strong>: Consistently poor behaviour with frequent appeals to mitigating circumstances and pleas for support and understanding is one of the psychopath’s most recognizable kitemarks – in both the corporate realm and that of everyday life.